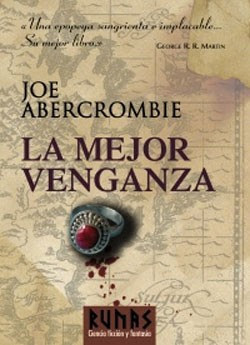 “La Mejor Venganza” can be translated as “The Best Revenge”, but we are more familiar with the original title of Joe Abercrombie’s novel, “Best Served Cold”. The Spanish edition which was released by the publishing house Alianza on Monday in their collection of science fiction and fantasy novels, Runas, has a different title, but also a slightly different cover. As you can see the Spanish publishers used a similar design, changing only a few details of the original cover. Alianza made an excellent choice in my opinion, because although they went for a new cover art, they kept enough elements that made the English cover a success and brought the Ravenheart Award for Best Fantasy Cover Art to the team behind it, Didier Graffet and Dave Senior for illustration and Laura Brett for art direction.